Holeshots, race-winning pace and a glitch with the left shoulder were the hallmarks of a bright, busy and notable Hawkstone Park International for Shaun today. Making his debut with RFX KTM and back on a 450 SX-F for the first time since 2016, Shaun set the second fastest time around the historic sandy course and was looking in fine form for his maiden competitive outing of the year and after solid training and testing days in Spain and Scotland in recent weeks. #24, who celebrated becoming a father for the first time to baby Angus the previous week, seized the holeshot in the first moto and was watched by a generous crowd. He led a sizeable gathering of MXGP peers. “I then blew out a berm by the mechanic’s area and landed on my ear,” Shaun says. Simpson remounted, dusted himself down while flushing out some winter rustiness and finished third behind fellow KTM runners Max Anstie and Max Nagl. Another holeshot came at the launch of the second MX1 moto. 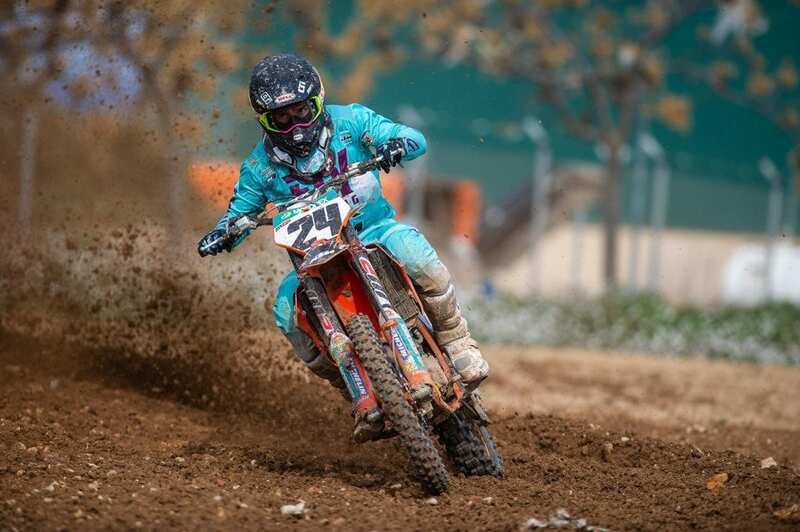 Shaun was passed by Italian Ivo Monticelli and was gaining ground in third position late in the race when he got a little out-of-shape on a jump and felt his left shoulder pull. The 30 year old had the joint swiftly corrected but the slight injury meant he was out of contention for the last chase: the Superfinal. RFX KTM will attempt LaCapelle Marival in France next weekend in the final race before the start of the 2019 MXGP Motocross World Championship launches in Argentina. If you would like to get in contact, please give me a shout.